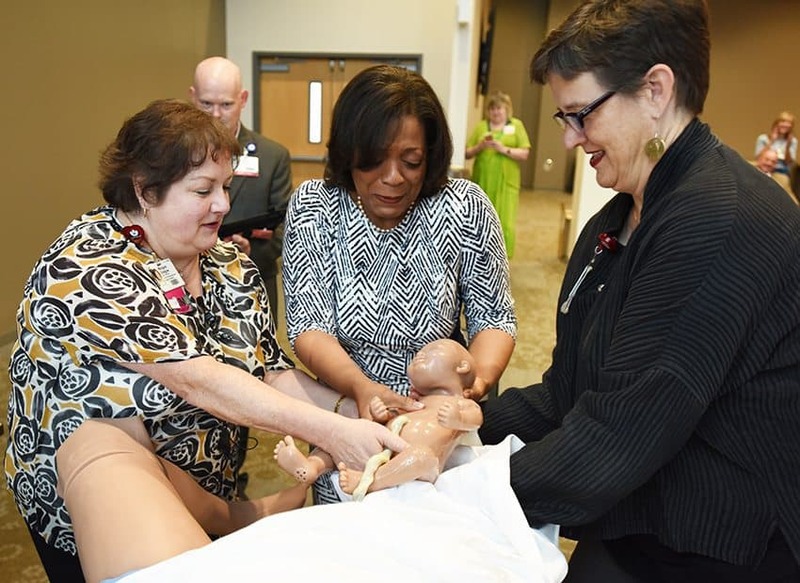 Vernita Dore, center, U.S. Department of Agriculture deputy undersecretary of Rural Development, delivers a baby during a live birth demonstration using a simulation manikin. Margaret Glasgow, left, and Mary Cantrell assist her. May. 25, 2016 | May 25, 2016 | The U.S. Department of Agriculture has awarded $1.6 million to two institutions to improve health in the Arkansas Delta through providing on-site simulation training for rural providers. At a news conference today at the University of Arkansas for Medical Sciences (UAMS), Vernita Dore, USDA deputy under secretary of Rural Development, announced the funding. 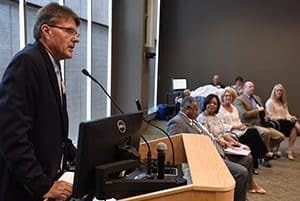 A grant of $752,832 goes to the Greater Delta Alliance for Health, which will use $268,360 to contract with UAMS and its Centers for Simulation Education to educate rural hospitals about a variety of situations, including birthing problems; trauma, such as tractor accidents; diabetic complications; pediatric emergencies; and stroke. 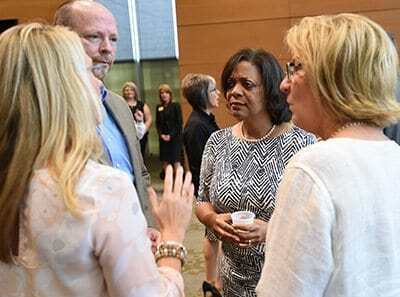 Vernita Dore, second from right, and Mellie Bridewell, right, talk with Rex Jones, second from left, before a news conference at UAMS. The other grant announced by Dore was $919,139 to the Black River Technical College in Pocahontas to purchase and upgrade simulation equipment and provide clinical training. Medical simulation education uses people roleplaying as patients, human manikins equipped with sophisticated electronics, and animatronics and documents to act out clinical cases and scenarios for training health care students and professionals. Some of the remaining grant funds will purchase training manikins and other simulation equipment, as well as a van to transport the equipment. The rest of the grant will pay for 30 firefighters in the Arkansas Delta to become certified EMTs. Tim Hill, UAMS vice chancellor for Regional Programs, addresses the audience at the start of the news conference. The training to be provided by UAMS is a part of the alliance’s Arkansas Delta Health Education for Local Providers (HELP) Program. In 2016, the HELP program expanded to include on-site simulation training for rural health and hospital teams for obstetrical emergency situations as well as to provide Neonatal Resuscitation Program (NRP) certification training to hospital delivery teams, other hospital medical staff members, pre-hospital providers, inter-facility transport providers, and emergency department staff in the Arkansas Delta. 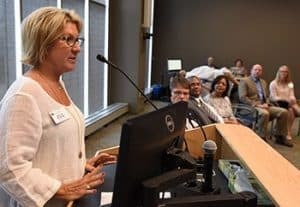 “The grant will help us to build on our earlier efforts and be of vital support to the alliance in achieving its goal of improving the health care workforce in the Arkansas Delta by providing free, on-site trauma simulation training and certification,” said Mellie Bridewell, executive director of the Greater Delta Alliance for Health. Mellie Bridewell, executive director of the Greater Delta Alliance for Health, speaks at the news conference. To establish and maintain current best medical practices and to better serve their Delta patients, the Greater Delta Alliance for Health, a not-for-profit organization of 10 Arkansas Delta hospitals, initiated the Arkansas Delta Health Education for Local Providers (HELP) Program in 2012. Relying on the educational expertise of the UAMS Center for Distance Health and telehealth technology, the HELP Program began with on-site health literacy training and access to continuing education for health care providers throughout the 19-county South Arkansas Delta. The Greater Delta Alliance for Health members include Ashley County Medical Center in Crossett, Baptist Health-Stuttgart, Bradley County Medical Center in Warren, Chicot Memorial Medical Center in Lake Village, Dallas County Medical Center in Fordyce, Delta Memorial Hospital in Dumas, DeWitt Hospital and Nursing Home in DeWitt, Drew Memorial Hospital in Monticello, Jefferson Regional Medical Center in Pine Bluff and McGehee Hospital in McGehee.